The German-born painter and graphic designer (who later became a Naturalized Dutch citizen) was born on November 3 and we like to take this opportunity to promote his poster “Die Farbe” which we are offering in our poster auction tomorrow. 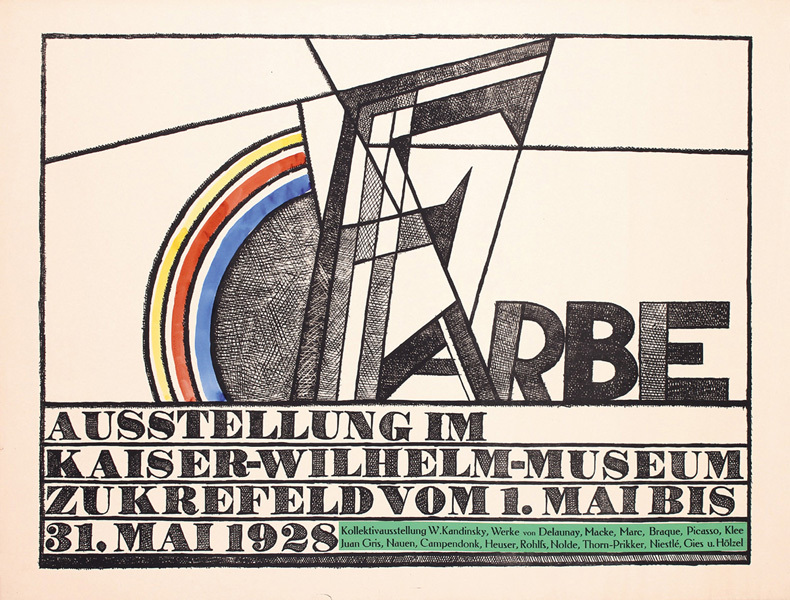 “Die Farbe” is an exceptionally rare, important poster advertising an exhibition devoted to ‘color.’ Printed in black-and-white, the rainbow and highlighted green area are all hand-tinted. The show itself featured some of the most important avant-garde artists of the era, including Kandinsky, Marc, Delaunay, Macke, Braque, Picasso, Klee, Gris, Naun, and Nolde. Interestingly, a list of the honorariums paid to the participants reveals that Campendonk received 560 marks for his contributions (which included this poster), while Kandinsky received a mere 200.